Rare French mapping of Singapore. Carte Des Detroits de Singapore, Durian et Rhio et des parages environnants; Dressee d'aprees les cartes d'Horsburgh et celle de l'Amirante Anglaise en 1840 et d'apres la carte Hollandaise du Detroit du Rhio . . . par M. M. Dittlof Tjarssens, Bloijs, Van Treslong, Prins et Van Gogh. An exceptionally rare 1852 nautical chart of Singapore and vicinity issued by Urban Dortet de Tessan, under the patronage of Louis Philippe I of France. French nautical charts of the Singapore region have long been overlooked by collectors and scholars in favor their more popular English counterparts. Nonetheless, this chart stands at the forefront of scientific mapping of the region and should be given due attention. Tessan's map covers from the southern tip of the Malay peninsula to the coast of Sumatra and from (roughly) Panjore to Tanjong Bon and eastward as far as the Kepulauan Riau and Riau Islands. It is details the Bantam Islands, including Batnam, Pulau Bulan, and Pulau Brintan. The focus of the map are the newly surveyed maritime routes south of Singapore, via the straits of Durian and Rhio (Riouw), towards the Dutch trading centers in Jakarta and the Pepper Ports of Sumatra. While inland detail is limited, the street structure of Singapore City is evident, as are some notable inland features, such as mountains and volcanoes. Profile charts appears in the lower left quadrant. 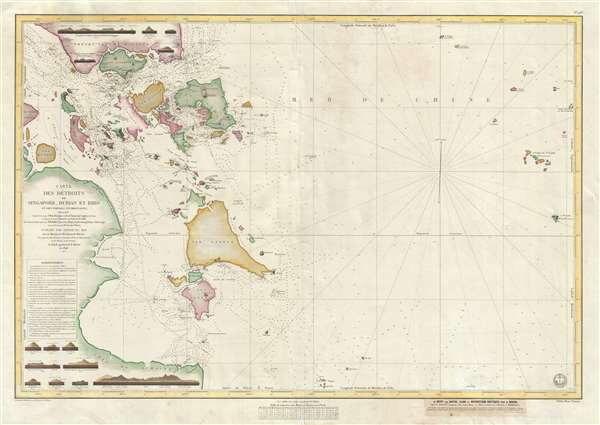 When Singapore was founded in 1819 the seas around the colony were only tentatively mapped. The Malacca straits, which had long been a major artery of trade, had been mapped, but within proximity of Singapore island, most early mappings fell apart. This chart follows on the work of Horsburgh, supplemented by new surveys initiated by the Admiralty in 1840. Additionally, it also drawn on Dutch surveys produced by Dittlof Tjasssens, Bloijs, Van Treslong Prins, and Van Gogh under the direction of M. Van der Plaat. Van der Plaat surveyed the islands just south of Singapore later in the same year. The consolidation of these various efforts under Dortet de Tessan represents a considerable advancement over both previous charts. The whole exhibits a level of meticulousness and detail rarely apparent in earlier charts of the region and is technically superior to the better documented British charts, such as the Thompson chart of 1846. The islands to the south remain loosely mapped, with some shorelines only ghosted in and other left notably blank, 'Partie inconue.' Nonetheless, significant advancement can be seen in the detailed sounding through in the Detroit de Rhio (Roiuw), the Detroit de Bolang, and the Detroit de Durian. This chart is unattributed, but bears enough similarity to other charts of the region that we can definitively attribute it to Urban Dortet de Tessan. Dortet de Tessas was, at the time this chart was made, employed as a hydrographic engineer by the Depot de la Marine. The engraving is the work of Jacques-Marie Hacq. The first edition appeared in 1846. The present example is a second edition with updates to 1852. The pastedown of P. Sauvat, a nautical instrument and chart seller in Bordeaux, appears in the lower right corner. A unique acquisition opportunity for the Singapore collector. Urban Dortet de Tessan (August 25, 1804 – September 30, 1879) was a French physicist and Hydrographer Engineer active in Paris during the early to middle part of the 19th century. Tessan was considered among the most scientific of cartographers active at the time and his work is notable for its meticulousness and precision. Tessan was born I Vigan, the scion of an old Languedoc family. He graduated from the École Polytechnique in 1825. Afterwards he completed detailed surveys of the coast of France. From 1836 to 1839 he traveled around the world making scientific observations on the frigate Venus under the command of Abel Aubert Dupetit-Thouars. Tessan published several important works on physics, hydrography, astronomy, and more. Some of his more significant research presaged the invention of sonar over one hundred years later. Dépôt des Cartes et Plans de la Marine (fl. 1720 - present), often called the Depot de Marine, was a French hydrographic mapping organization founded in 1720 under Charles-Hercule of Albert de Luynes (674-1734). Much like the U.S. Coast Survey, the British Admiralty, and the Spanish Deposito Hydrografico, the Depot was initiated as a storehouse and distribution center of existing nautical and marine charts. Eventually the depot initiated its own mapping activities in an attempt to improve and expand upon existing material. Some of the more prominent cartographers and hydrographers associated with the of Dépôt des Cartes were, Philippe Buache, Jacques-Nicholas Bellin, Giovanni Rizzi-Zannoni, Rigobert Bonne, and Jean Nicolas Buache. Jacques-Marie Hacq (September 22, 1785 – 18??) was a French letter and line engraver, and historian, active in Paris during the middle part of the19th century. Hacq was born in Paris and trained under J. P. Besançon, who he succeeded at the Dépôt de la Guerre in 1830. He engraved for the Dépôt de la Guerre as early as 1830 and for the Dépôt des Cartes et Plans de la Marine from, at least, 1840 to 1852. In addition to his work for the French Government, he also completed maps engravings for Lesage, Lapie, Dufour, Duperrez, Gouvion St. Cyr, and Dumont d'Urville. His historical works include a history of the Napoleonic Wars and a history of Paris under the reign of Louis XIII. During most of his career in paris he lived at 58 Rue de la Harpe. Very good. Some creasing on original centerfold.